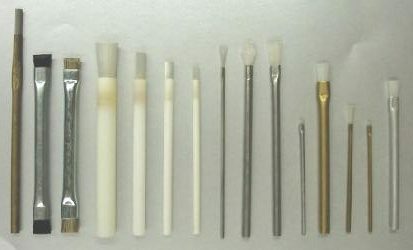 Cylinder brushes are typically found in industrial applications where large objects need to be cleaned using an automated system. The wires of the brush are installed all the way around a cylinder that is usually mounted on bar where it can rotate a full 360 degrees. Cylinder Brushes Cylinder brushes are typically found in industrial applications where large objects need to be cleaned using an automated system. The wires of the brush are installed all the way around a cylinder that is usually mounted on bar where it can rotate a full 360 degrees. For computers to function properly once they reach consumers, manufacturers need to ensure that no dirt particles have entered the components during the fabrication process. Small amounts of dirt could disrupt connections and hinder the computer's function. A small cylinder brush can be rolled over the circuit board to remove loose particles and clean the part without damaging it. For more heavy duty applications, a cylinder brush can be made with wire instead of a softer plastic material. The wire barbs of the brush allow it remove grit and contamination from rough surfaces. Wire could damage delicate components, but it can be the only solution if a rough metal surface needs to be cleaned before being polished or painted. Some cylinder bushes are made with a wound spiral brush pattern, making them more effective during detailed cleaning because the brush makes contact with more cracks and crevices in the object being cleaned. 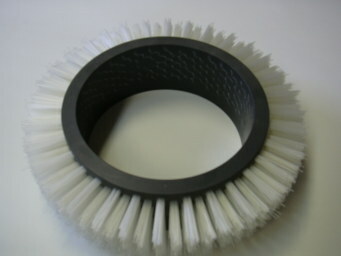 A cylinder brush can also be mounted on a roller where it is attached to a motor. Rather than passing objects underneath it on a conveyor belt, the object can be held to the brush for cleaning as it spins. This gives the operator greater control over the cleaning process because they can move the object around to make it contact the brush wherever they like.